Today I’m so excited about sharing this new recipe with you because it’s delicious and it has been about 2 weeks that I didn’t write a post. I apologize about that, but I decided to take a two weeks’ vacation to spend time with my family. We went to UK (London, Liverpool and Wales) because my husband had to go there for work. We took advantage of this opportunity and stayed in Europe for three weeks. It was very cool. We visited lots of new places, cities, castles, met great people and ate good food too. My toddler loved everything. He was very excited especially about the train rides 😉 Soon I will post photos about our trip here on the blog. Stay tuned! In a bowl, add shrimp, salt, pepper, red pepper flakes and onion powder. Mix everything well. In a cast iron skillet add 2 tablespoon of olive oil or grass-fed Ghee butter over medium heat. Add garlic and sauté for 30 seconds. Add shrimp and sauté for about 4 minutes or until shrimp is cooked through. Be careful to not overcook them, otherwise they will have a rubbery texture. Set aside. In the same skillet add 1 tablespoon of olive oil and mushroom. Sauté for 5 minutes. Then add asparagus and cook until it’s tender. Stir occasionally. Return shrimp back to the skillet and mix everything well to combine. Garnish with fresh parsley. Enjoy! 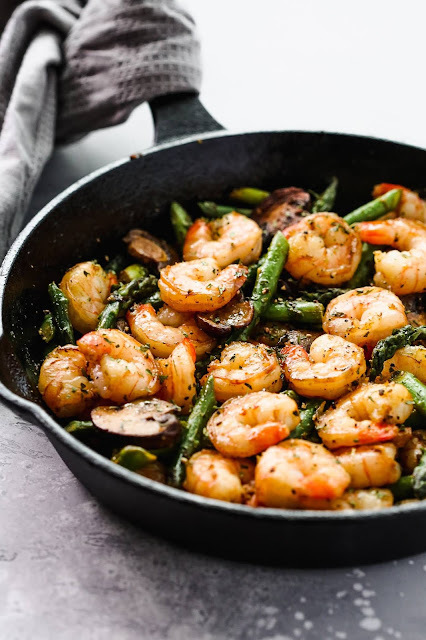 0 Response to "Garlic Shrimp Asparagus Skillet"